The following are camps we have been to or have been recommended to us, most of these camps we have stayed in. Horse camping is easier than you think and with a little preparation you can travel cross country enjoying nature and seeing sites only possible from horse back. Other riders are the best source of information and once you start staying in Horse camps the locals are a wealth of where and how's. On our last trip was to Gulf Port Mississippi we met Jane and her family; and they helped us with local info even watching our horse's so we could see our son in New Orleans. We plan another visit over the 2002 Christmas break. Any help I can be let me know, we have camped across this great land for over 20 years and I love talking horses. Click the state you are interested in to see camps we have stayed in , in that state. There are many horse camps across the state Contact Michigan DNR for information. The Michigan Trail Riders Assoc. have done a wonderful job on this almost 300 mile trail system going from Oscoda to Empire MI. Camps are all rustic offering water and a place to picket your horse. Ranch Rudolph offers full facility. Traveling across the state from shore to shore offers more than just the 20 some miles per day you ride. A bus is available to take you back to your horses once you have jumped your rig to the next site. John is usually on hand for some good trail site cooking at a very reasonable cost and you just can't beet the folks . You can sign on for a weekend or the full trip. Membership in the Michigan Trail Riders is required before you can join the rides but the $30 fee gets you loads of maps news letters and more. The cost for the 2 week ride runs about $30/person. Located near Kalamazoo MI rustic camp some20 miles of trails. Located near West Branch MI beautiful riding along the AuSauble River part of the shore to shore system. Troutdale: Hot Showers, Restaurant, Horse Shuttle, Water & Electric Hookups, Horse Wash Rack and much much more. Close to over 700 miles of trails in Jefferson National Forest in Mt. Rogers and White Top Mountain Area. White Pine Horse camp, Hilly, maps, Camping, 200 miles of trail. Oneida: 200 Miles of Trail plus another 200 in old logging and back country roads. Three facilities for horses. 3 Station Horse camp and Bear creek Horse camp, have modern horse camps, Contact Brandy creek visitor Center. Jamestown: Saddle Valley Campground is located on Hwy. 297, four miles east of the junction of Highways 297 and 154, just outside the Big South Fork National River & Recreation Area. Campground is located about 8 miles from Bandy Creek Campground. For reservations call (931) 879-6262. If you need extra horses, a guide or a cabin, Southeast Pack Trips, Inc. is located next door and can be reached by calling (931) 879-2260. Mountain City: 50 + Miles of mountain trail. Camping, barn, showers, elect hook-up. Beautiful trails well marked nice but small rustic camping .Contact DNR for reservations and route permits. Back country camping allowed 3 sided shelters provided. Cost is very reasonable. Take I-40 to the Wilton Springs Exit (440) and follow the signs to Gatlinburg. When on US 321 keep going straight, rather than take the right-hand turn at the fireworks store just past the Cosby Smoky Mountain Information Center. The entrance to the Cosby Campground will be one mile ahead. Martin's Stables is on the left, one half mile past the Cosby Campground entrance. Take Exit 116 (Hwy. 114) off I-40 between Jackson and Nashville, TN. Rockbridge Ohio (southeastern Ohio) Ohio's Appalachian Country. The state offers a free rustic camp ground with 23 primitive sites off Laurel Twp.Rd.231 water for horses only. Near by Palmerosa private camp offers $15/night complete hook ups. (614/385-3799) Considered the best trail riding in Ohio. Many areas of interest for the whole family. Contact Hocking Tourism Assoc. Near Nashville IN. Brown County offers so much, both for the novice and the experienced rider. The camp ground offers everything from rustic to full service sites. Plenty of trails available 86 miles in Brown County itself. Hitching rails on built up mounds help when picketing horses. Shops and stores are within ridding distance. Trails are well marked. Call (812)988-6406 or (812)988-4418 for information. located right next door to Brown County and the trails interlink. located south of Brown County with many private stables near by. Near Birmingham AL this rustic horse camp offers caves, ledges, waterfalls spectacular views. Some what difficult to find located in William Bankhead National Forest. 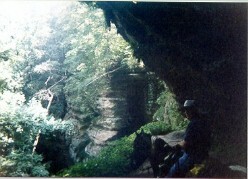 Just east of Birmingham AL this rustic horse camp offers caves, ledges, waterfalls spectacular views. Located off 20 the famous Montgomery to Jackson ride originates here. 502/ 286-8167 Full facilities stalls available, 75 miles of trails, trail into Mammoth Cave Park, right in camp beautiful riding in late fall. A little pricey at $20/night but worth it.